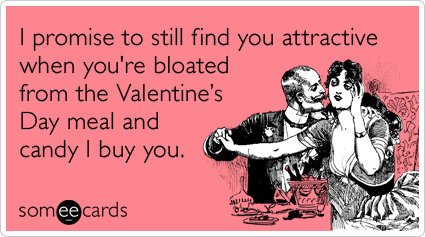 Valentines Day approaches – love me, love my gut – even if it misbehaves sometimes. A little flippant perhaps – but also some truth, love me love my GUT! If you are going on a date you may want to go to an establishment that you know well and ask for a table to be reserved in a good position, making it easier should you need to visit the toilet. Making a suggestion about where to go on a date shouldn’t cause a problem, just be a little assertive and ensure that you explain about your IBS at some point—if someone wishes to go out with you this really shouldn’t be an issue. You could also a look at the menu before your visit and telephone the chef to ask if they can cook your food without ingredients that may cause problems if this helps. See if your partner also wishes to look at the menu before arriving, this will leave more time for conversation and getting to know each other. Looking at the menu is easier to do these days as most restaurants post menus on-line. If foods high in fat are a problem for your digestion then ask for the meat grilled or cooked on a griddle which will allow the majority of the fat to drain away. Vegan options are a little more challenging as they often contain foods high in fermentable carbohydrates, but a risotto based on Low FODMAP vegetables or rice stuffed peppers would be an option here, not forgetting to ask about use of onion and garlic in the dish, should you need too. Wheat free pasta I presume? Some people find alcohol is a problem, if you want to have alcohol and it does give you symptoms, limit the amount that you have. You could have a glass of wine, for example with your main meal, or ask for a spritzer to make a longer drink. Order a spritzer with your starter and allow it to go a little flat before drinking it, if you suffer from bloating. Using an implement such as a straw or cocktail stirrer to mix your drink will help to disperse the gas it contains, but don’t be tempted to drink from the straw. You could try a little seduction and gaze into your partners eyes, whilst stirring your drink! Watch the amount of fruit cocktails you have, if you have fructose intolerance—one small glass (100 ml) of pure fruit juice containing low FODMAP fruits is usually the maximum advised. So ensure your cocktail has no more than this amount and drink it with the main dish or sweet. Check out The IBS Network Self-Care Plan for medications that are helpful. I would really encourage you to eat out this Valentines Day if you are invited, you may have some symptoms because it can be difficult to avoid all FODMAPs, but the most important factor is that you go out and enjoy the experience. You might find a life partner by going on the date, what more could you wish for? If you don’t have a partner, you could plan to do something special with friends or family for the day. Most of the advice has been about functional gut problems (IBS) but if you have inflammatory bowel disease IBD, some of the advice posted may be useful but I would strongly advise you to go on-line and check out Crohns & Colitis website (link to the main site is found to the right) as they have some really useful advice on relationships and IBD, or the link for The Ileostomy and Internal Pouch Association for advice. Now for the bah humbug ;-), this advice also applies to the rest of the year! Valentines Day is very commercialised, expensive and anticipation of events occasionally can prove to be disappointing if you spend lots of money on the day. You could always suggest going out at another time, if you wish and there are other ways of showing your affection than an expensive card and some petrol station bought carnations! If you know what your partner likes, try making your own gifts, some baking perhaps (and I do include you gentlemen readers here too)—invest some time and personalise your gift, this will be really appreciated as it shows your love and understanding. Next Post Reflection on a year of blogging. Nothing helps my ibs sadly. I agree it is sad that you feel like this, have you tried to contact the IBS Network helpline nurses? You can contact them here http://www.theibsnetwork.org/helpline.asp or if you are not from the UK and cannot contact them because of the time your country should have a support network to help.